The mark of the best players, in any sport, is the ability to perform at their best when they ar under the most pressure. If a player is able to step up and perform well when the fans, team mates and coaches need it the most, this is the sort of player that people want for their team. Players that score the vital points in Finals or in the games that people remember for a long time are the ones that have legendary status placed on them. In the NBA, the biggest platform a player has to showcase their skills on is the NBA Finals. This means a player grabbing a career best performance in Game 3 of the NBA Finals is going to grab the headlines and the adulation of their crowd. 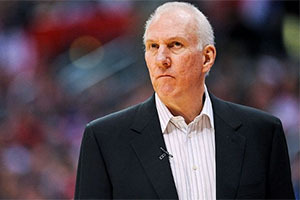 San Antonio Spurs made their way to Miami no doubt smarting from a home loss. A first match victory when the air conditioning made sure the Heat melted before the end of the game was cancelled out by LeBron James showing that he remains a cool character. With a score of 1-1 after two San Antonio home games, it was easy to see why many people felt that the Finals were there for the taking for the Miami. This may still be the case. It is not as though Miami heat should be ruled out at this stage, not with another home game looming and the score line standing at 2-1 to Spurs with 4 games to go. There is absolutely nothing won or lost yet in the 2014 NBA Finals but that doesn’t mean that the role of Kawhi Leonard in Game 3 should be diminished. The player helped himself to 29 points, the most he has ever scored in a basketball game. This doesn’t just refer to his NBA career, 29 points is a career high including high school, college and NBA basketball. No player has achieved a career high in a Finals match in over 10 years, which should give you an indication that this is not the easiest thing to do. Kenyon Martin delivered 35 points back in 2002 when he was lining up against the Los Angeles Lakers, so there has been more than a full decade since a basketball player hit the career heights during the big games that really matter at the end of the NBA season. 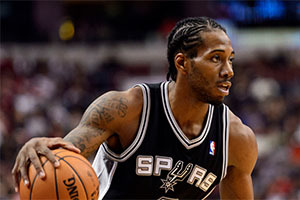 San Antonio Spurs Coach Gregg Popovich has long said that Leonard is a special player and even before the start of last season, the coach was hailing Leonard as the future face of the franchise. For most of his Spurs career, Leonard has been sitting back as a defensive stopper, allowing players like Tony Parker, Manu Ginobili and Tim Duncan to do the offensive damage. Popovich needed more from his player, especially after the first two games in the series where Leonard was far from being at his best. If criticism was starting to build around the player, he answered his critics in the best possible manner. It is important not to get carried away too soon; Leonard may still end up as a loser in the 2014 NBA Finals. However, the youngster has now raised the bar and he knows what people are expecting from him. If he can deliver another one or two performances like he did in Game 3, the San Antonio Spurs may find that they have clinched their dream prize this season.